Opinion: Who will be the biggest surprise in the NASCAR Playoffs? Sure, “Big 3” drivers Kyle Busch, Kevin Harvick and Martin Truex Jr. are all the talk, but who has the potential to spoil the party in this year’s Monster Energy NASCAR Cup Series Playoffs? Anything can happen in three rounds of eliminations over the course of 10 races, which opens up the possibility for a driver or two to really shake things up. NASCAR.com’s Zack Albert and Chase Wilhelm make their predictions on who’s lurking under the radar to potentially beat the postseason odds. This might rank as a milder spoiler pick than most, but Hamlin enters the playoffs winless for the first time since 2013 — a year in which he missed the postseason in part due to injury. His streak of winning at least one race in each season of his career currently sits in jeopardy, but there’s reason to believe that he’ll fill that void over the course of the 10-race final stretch. The prevailing logic includes the schedule itself. Excluding the all-new-for-everyone Charlotte road course, Hamlin has won at seven of the nine remaining tracks in the postseason mix. 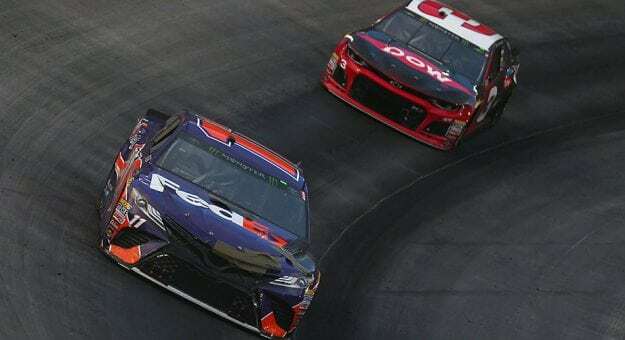 Hamlin maintains short-track strongholds at Richmond (three wins) and Martinsville (five wins), both venues that could hold the key to the No. 11 Toyota team avoiding elimination. Hamlin’s speed has shown a recent surge with Busch Poles in three of the last five races to close out the regular season. When that same pace shows up in the results column, Hamlin’s path forward — potentially even to the Homestead finale — gets a steady dose of optimism. After locking himself into the postseason by taking the No. 3 back to Victory Lane in the Daytona 500, Dillon only managed to score three other top-10 finishes during the regular season – Fontana (10th), Daytona-2 (9th) and Michigan (4th). So, why pick him to stir the pot? Despite some lackluster results in the first 26 races, Dillon and Richard Childress Racing took a brand-new race car to Michigan and found some extra speed — speed they may be saving to break out over the next 10 races. Although Dillon finished 13th or worse in the last three events of the regular season, the potential is there for him to go on an unexpected tear. Dillon has earned two career victories in crown-jewel events playing an underdog role, so success in high-pressure situations isn’t an issue. It’s actually right in his comfort zone. My prediction: A win will be difficult, but look for Dillon to slide his way into the Round of 8 by racking up some consistent finishes.